So I decided to wait until 5.0 launched and I had a chance to play around with the new talents and glyphs before I posted my thoughts. After spending 8 hours doing Dungeons, LFR, and a Dragon Soul Raid, I finally feel like I’m more comfortable with the passive changes to our Spec in Mists of Pandaria. I cant lie to you, I feel as though the Devs left us Holy Paladins alone since we pretty much heal the same way pre 5.0 (Thank You Ghostcrawler). We got some nice additions to our healing throughput, Hand Spells and a few cool proc’s, but I’m still Beaconing the tanks and banging out my single target and Holy Power Heals. So first I played around with our talents and this is going to be my basic setup. Now of coarse from boss to boss it might change. Speed of Light: Increases your movement speed by 70% for 8 sec. Long Arm of the Law: A successful Judgment increases your movement speed by 45% for 3 sec. Pursuit of Justice: You gain 15% movement speed at all times, plus an additional 5% movement speed for each current charge of Holy Power up to 3. First off, I am done with Judgement. So much I removed it from my Bar, and having a 15% movement speed at all times didn’t seem like a must have. Who knows maybe once I jump into raids I’ll change my mind. So until then I’m going with Speed of Light. It’s a guaranteed speed boost when I need it and it really came in handy for Cataclysm. I even made a Macro to combine it to Divine Protection. Old habits are hard to break. Fist of Justice: Stuns the target for 6 sec. Replaces Hammer of Justice. Repentance: Puts the enemy target in a state of meditation, incapacitating them for up to 1 min. Any damage from sources other than Censure will awaken the target. Usable against Demons, Dragonkin, Giants, Humanoids and Undead. Burden of Guilt: Your Judgment hits fill your target with doubt and remorse, reducing movement speed by 50% for 12 sec. For me it was a toss up between Fist of Justice and Repentance and I figured since I’ll be back to grinding Dungeons when Mists drops, having a 1 minute Crowd Control would be a good thing. I’m sure there’ll be times when I drop Repentance for Fists of Justice(PVE) and Burden of Guilt definitely has its place in PVP. Selfless Healer: Your successful Judgments reduce the cast time and mana cost of your next Flash of Light by 35% per stack and improves its effectiveness by 35% per stack when used to heal others. Stacks up to 3 times. Eternal Flame: Consumes up to 3 Holy Power to place a protective Holy flame on a friendly target, which heals them for 5240 to 5837 (+ 49% of SpellPower) and an additional 508 (+ 5.85% of SpellPower) every 3 sec for 30 sec. Healing increased per charge of Holy Power. Replaces Word of Glory. Sacred Shield: Protects the target with a shield of Holy Light for 30 sec. The shield absorbs up to (30 + 1.17 *holy spell power) damage every 6 sec. At first glance and testing in Beta I thought Selfless Healer was really gonna find its place on my healing roster, however after trying it out in several dungeons, once again I find it to be a burden with all the Judgement casting you must do in order to reach 3 stacks. Now I am really happy that Blizzard has given us Sacred Shield back but I did find it to have less “Bang” for its buck. Hopefully before Mists goes live they’ll give it a “slight” buff. 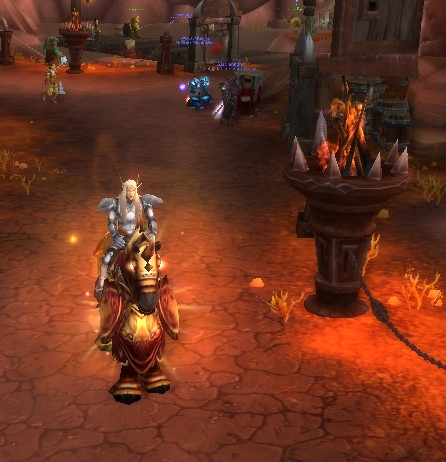 Like in Wrath I kept it on the tank but the one that really impressed me was Eternal Flame. I kept a 3 holy power Eternal Flame rolling on the tank taking damage and I could definitely tell the difference when there wasn’t one on them. Hand of Purity: Places a Hand on the friendly target, reducing the damage of harmful periodic effects by 70% for 6 sec. Players may only have one Hand on them per Paladin at any one time. Unbreakable Spirit: When your Divine Shield, Divine Protection or Lay on Hands are on cooldown, spending Holy Power will reduce the remaining cooldown by 1% per Holy Power spent, up to a maximum of 50% reduction. Clemency: You can use Hand of Freedom, Hand of Protection, Hand of Sacrifice and Hand of Salvation twice each before incurring their cooldowns. Ok, scratch Unbreakable Spirit. I just don’t see the benefit of it as compared to the other two, not even in PVP. Now it’s definitely gonna be on a boss per boss basis whether I go with Hand of Purity or Clemency. I suppose it will have to do with how much damage the tank is taking and for how long. Two HoS can give someone 24 seconds of damage reduction(30%) vs HoPur 6 seconds of damage reduction(70%). Right now I’m using Hand of Purity since its cooldown is only 30 seconds. Holy Avenger: Abilities that generate Holy Power will deal 30% additional damage and healing, and generate 3 charges of Holy Power for the next 18 sec. Sanctified Wrath: Avenging Wrath lasts 50% longer and grants more frequent access to one of your abilities while it lasts. As Holy Spec- Reduces the cooldown of Holy Shock by 50%. Divine Purpose: Abilities that cost Holy Power have a 25% chance to cause the Divine Purpose effect. Your next Holy Power ability will consume no Holy Power and will cast as if 3 Holy Power were consumed. Lasts 8 sec. I could definitely see using Sanctified Wrath in PVP since you’ll be able to get 10 buffed Holy Shocks in 30 seconds while moving. Now with Holy Avenger and Divine Purpose, both really served their purpose. HA put out some really nice AoE healing(had to be careful not to eat up a ton of mana) whereas DP gave me more opportunities to use my free Holy Power heals(which equates to saving mana). At one time it proc’d off 3 Lights of Dawn back to back. For the time being since I have to be somewhat careful with how I spend my mana spells, I’m going with Divine Purpose. Plus its one less button I have to worry about. Holy Prism: Sends a beam of light toward a target, turning them into a prism for Holy energy. If an enemy is the prism, they take 14523 to 17750 (+ 142.8% of SpellPower) Holy damage and radiate 9794 to 11969 (+ 96.2% of SpellPower) healing to 5 nearby allies within 15 yards. If an ally is the prism, they are healed for 14523 to 17750 (+ 142.8% of SpellPower) and radiate9794 to 11969 (+ 96.2% of SpellPower) Holy damage to 5 nearby enemies within 15 yards. Lights Hammer: Hurl a Light-infused hammer into the ground, where it will blast a 10 yard area with Arcing Light for (17 sec.5) sec. Arcing Light- Deals 3268 to 3993 (+ 32.1% of SpellPower) Holy damage to enemies within the area and3268 to 3993 (+ 32.1% of SpellPower) healing to allies within the area every 2 sec. Execution Sentence: A hammer slowly falls from the sky, causing holy spell power*5936/1000+26.72716306*486 Holy damage over 10 sec. This damage is dealt slowly at first and increases over time, culminating in a final burst of damage. Stay of Execution-If used on friendly targets, the falling hammer heals the target for holy spell power*5936/1000+26.72716306*486 healing over 10 sec. This healing is dealt slowly at first and increases over time, culminating in a final burst of healing. 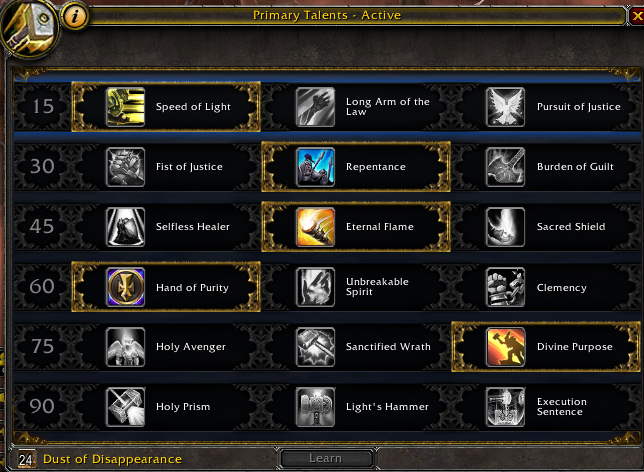 Now since I didn’t level a character to 90 while in Beta, I cant decide which talent I’d use based on experience. But looking over them I could see myself playing around with Lights Hammer, a Paladins first ever ground based AoE Heal over Time. And Execution Sentence looks like it has its place as an extra HoT to throw on the tanks. Glyph of Avenging Wrath: While Avenging Wrath is active, you are healed for 1% of your maximum health every 2 seconds. Glyph of Beacon of Light: Removes the global cooldown on Beacon of Light. Glyph of Blessed Life: While Seal of Insight is active, you have a 50% chance to gain a charge of Holy Power whenever you are affected by a Stun, Fear or Immobilize effect. Glyph of Divine Plea: Divine Plea now has a 5 sec cast time, but you receive 12% of your total mana instantly and your healing is not reduced. Glyph of Divine Protection: Reduces the magical damage reduction of your Divine Protection to 20% but adds 20% physical damage reduction. Glyph of Divinity: Increases the cooldown of your Lay on Hands by 2 min but causes it to give you 10% of your maximum mana. Glyph of Flash of Light: When you Flash of Light a target, it increases your next heal done to that target within 7 sec by 10%. Glyph of Light of Dawn: Light of Dawn affects 2 fewer targets, but heals each target for 25% more. Glyph of Protector of the Innocent: When you use Word of Glory to heal another target, it also heals you for 20% of the amount. Glyph of the Battle Healer: Using melee attacks while using Seal of Insight heals a nearby injured friendly target, excluding the Paladin, within 30 yards for 30% of damage dealt. I went with Glyph of Divine Plea/Glyph of Divinity (For Mana Regen Purposes) and Glyph of Light of Dawn (Since I’m healing in 10 mans primarily). Now I’d say we did pretty good on Major Glyphs this new expansion because I can think of many DS fights where I could use each one, but time will tell come MoP. However, I’m really looking forward to trying out Glyph of Battle Healer and seeing what type of healing throughput we’ll be able to put out (Melee swings healing myself, healing the raid, and regenerating mana!! Talk about double dipping). 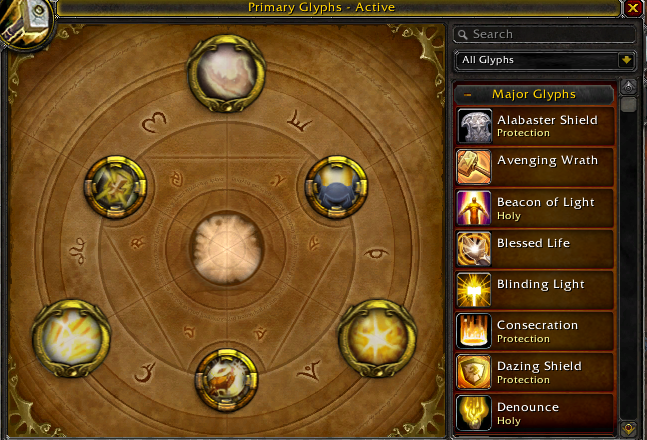 Also wanted to mention that I left a ton of other great Major Glyphs out of the post, which I think will be awesome for healing in PVP, but that will have to wait for a later post. Not going to mention all of them since they’re just a fun and visual enhancing glyph, but I’ll list the three I’m starting with. Glyph of Contemplation: Allows you a moment of peace as you kneel in quiet contemplation to ponder the nature of the Light. 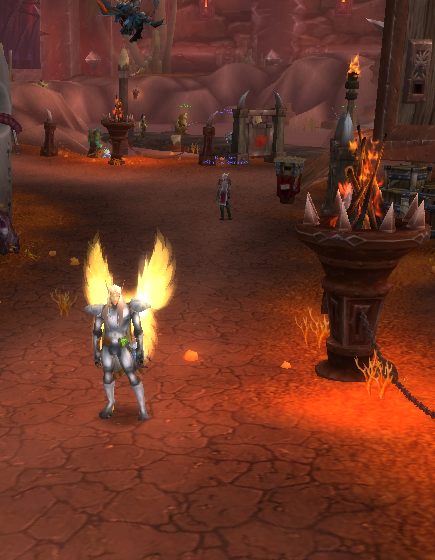 Glyph of Winged Vengeance: Your Avenging Wrath depicts 4 wings. Glyph of Luminous Charger: Your Paladin class mounts glow with holy light. I’m really enjoying the new talent system and most of the choices we’ve gotten. The ones they’ve given us definitely might hint as to what lies ahead as far as content and giving us the ability to deal with it. So far I have my favorites and I’m sticking with them since they fit my play style. However, I can adapt to the situation by pulling from my Talent Bucket if the need arises. Some of the cool ones really pertained to Shockadins in PVP especially our new glyphs, so you can be sure that I’ll be playing around in BG’s and writing about it. After 5.0 I did notice that my mana regen was somewhat decreased while raiding and that I had to go back to using the right spell for the right damage (more Holy Light and Holy Shock) instead of Holy Radiance spamming as I pretty much was guilty of doing in 4.3. Some other things you can do in order to help with mana regen is switch your gems (Red to Purple) and if you’re a Jewelcrafter (Epic Red to Epic Blue)”JoeEgo gets credit for this one“!! I even went as far as removing Power Torrent, replacing with Heartsong for my Weapon Enchant. Remember Intellect only affects Spell Power and Crit. It no longer increases your mana pool. Only Spirit now affects the amount of mana that we’ll regenerate. 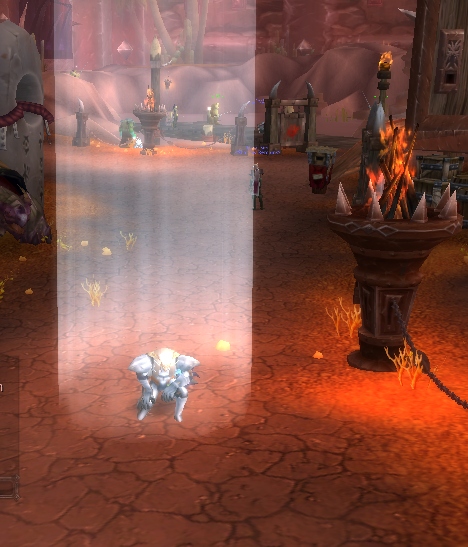 Once MoP hits and we start upgrading our gear with higher Spirit, then will we see mana being less of an issue. But honestly Blizzard, don’t make it too easy. Everything I’ve done comes from experience and research so I wanted to share some of the great blogs I read through for some good Holy Paladin goodness.